Karel Janoušek was born on October 30, 1893, in Přerov in Moravia, as the second child of Karel Janoušek and Adelheid Janoušková (1866 – 1895). His father, a clerk at Austrian-Hungarian Imperial railway, was one of the founding members of the Czechoslovak Social Democratic Party. When Karel Janoušek (1866 – 1927) was about two-years old, and his sister Jindřiška (1892 – 1940) about three, their mother died and their father married Božena Kreminkova (1869 – 1969) with whom he had another nine children. Such a large family was nothing exceptional at that time as the last 20 years of the reign of Franz Josef I was a period of economic stability and growth, and this had positive impact on demographic development. At high school, he was influenced by then popular columnist Josef Svatopluk Machar, and considered himself a Czech patriot. On July 10, 1912, he graduated from Grammar School. Although the school was meant to prepare their students for university, Janoušek did not continue in his studies so as not to be a burden for his large family. After completing a course at local German Business School he spent three years working as a clerk at local firm Kratochvil which belonged to a distant relative. The Austrian-Hungarian Empire was not popular among the Czechs. It is not known what was the reaction of the family to the assassination of Archduke Franz Ferdinand on June 28, 1914; but what is known for sure is that a substantial part of Czech society did not consider WW1 a conflict they wished to get involved in. The emperor’s assassination resulted in declaration of war on Serbia by Austria, and as a chain reaction it activated the system of European Alliances. Karel Janoušek was certainly not happy when he received his conscription papers. He was drafted on June 2, 1915. At that time, the Allies had already landed at Gallipoli (April 15, 1915); German forces used poisonous gas against the French at Ypres (April 22, 1915); and the Lusitania had been sunk (May 7, 1915). On June 15, 1915, he reported as a one-year volunteer to the 57th Infantry Regiment. He passed basic training and was sent to the reserve officers’ school in Opava and was promoted to the rank of Corporal. In November 1916, his unit was sent into combat. He first experienced combat in Southern Tyrol in Italy during the offensive at Isonzo river which resulted in capture of town Gorizia by the Italians (August 8, 1916), but he did not stay there that long as in June 1916 their unit was sent to Russia to take part in the Brussilov’s offensive which inflicted some 1.5 million casualties on the Austrian-Hungarian Army. On July 2, 1916, Janoušek was captured by the Russians and was sent to a POW camp near Kiev, Ukraine, from which he found his way to the Czechoslovak Legion which was forming there. By that time, Vladimir Ilyich Lenin’s visions started taking shape in industrial areas, and unrest started affecting war production, and food shortages caused strikes in German shipyards. In August 1916 Romania, emboldened by the German defeat at Verdun, the bloody stalemate on the Somme, and the Austro-Hungarian collapse precipitated by the Russian Brussilov’s offensive, declared war on the Central Powers. In these circumstances, Janoušek on August 1, 1916, joined the Serbian army in Odessa (II Serbian Volunteer Division), which was easier for Czech POWs. Before the Bolshevik Revolution, it was easier to join the Serbian army which was pro-Russian but not Tsarist. In addition, to join the Russian Army, Czechoslovaks, who were generally pro-Slav oriented, would have to apply for Russian citizenship which most of them were not willing to do. The difference from Czechoslovak units in Russia, Serbian army recognised Austrian-Hungarian ranks. On October 14, 1916 Janoušek left the Serbian Army and joined the 1st Czechoslovak Rifle Regiment in Borispol’, Ukraine, as a rifleman with a rank of a Private, and on December 8, 1916 he was assigned to the 3rd Company led by Lt. Otakar Husák (1885 – 1964). They usually worked under Russian command where they were mainly recognised for their tactical reconnaissance skills. From December 8, 1916, to May 25, 1917, Janoušek participated in reconnaissance missions on the front line as a Squad Leader. In May 1917, he was promoted to the rank of Private First Class [PFC]. In spring 1917, the Bolshevik revolution broke out and seriously affected combat capability of Russian forces. The fall of the Russian Monarchy was welcomed by vast majority of Czechoslovaks because it allowed formation of a Independent Czechoslovak Company. The Czechoslovak Brigade was accepted by General Brussilov as part of 7th Russian Army. The 1st Czechoslovak Rifle Regiment in which Janoušek served participated in the Battle of Zborov (July 2, 1917, Eastern Halic, Slovakia, Kerensky’s offensive), where 1st Czechoslovak Rifle Regiment fought Czechs in Austrian-Hungarian colors (35th and 75th Infantry Regiments). But the victory at Zborov could not save Russian Tsarist army which was fast falling apart because of the Bolshevik coup. Janousek did not take part in this battle because he got wounded on June 18, 1917, and remained in hospital until August. This earned him promotion to a warrant officer what at that time was an officer rank. In the end of 1917, Czechoslovak Legion in Russia had 38,500 men. In the context of huge WW1 operations in the European Theater, activities of Czechoslovak legion can be pinpointed as part of the Kerensky’s offensive which resulted in retreat towards Tarnopol. The Russian front effectively fell apart because of the chaotic situation after the fall of Monarchy and consequent Russian Civil War (April 1918 to November 1920; Bolsheviks vs. Whites plus Allied supporters vs. nationalists). Shortly after announcement of President Woodrow Wilson’s Fourteen Points (January 8, 1918) which in point X stated that “The peoples of Austria-Hungary, whose place among the nations we wish to see safeguarded and assured, should be accorded the freest opportunity to autonomous development”, on February 7, 1918, future Czechoslovak President Tomaš Garrigue Masaryk incorporated Czechoslovak Army in Russia into independent Czechoslovak Army formed in France and strived for transfer of the troops from Russia to France. During retreat from Ukraine, Czechoslovak legion engaged in some fights with German army. The main objective was to load the troops, armor, and material on 60 trains and through trans-Siberian railway get to port Vladivostok in the Far East, and from there to get to France. On March 26, 1918, Czechoslovak delegates in Russia agreed with the Soviet administration that the Czechoslovaks will surrender their guns to the Bolsheviks at Penza. Penza is a place where a major concentration camp was located. On June 4, 1918, Leon Trotsky proposed creation of concentration camps for insubordinate Czechs. In August, he ordered the creation of two camps, in Mourom and Arzamas, for “underhand agitators, counter-revolutionary officers, saboteurs, parasites, and speculators”; and on August 9, Lenin sent an order to the Executive Committee of the Province of Penza instructing them to intern kulaks, priests, White Guards, and other doubtful elements in a concentration camp. Brest-Litovsk Treaty which was signed in Moscow only four days later effectively ceased the state of war between Germany, Austrian-Hungary, Bulgaria and Turkey on one hand and Russia on the other hand. The Bolsheviks then attempted to either involve the Czechoslovaks in their cause or to shove them in labour camps. This development was greatly facilitated by part of Czechoslovak political representation: on May 24, 1918, Edvard Beneš sent a telegram to the Legions to cease fighting and hand over the rebels to the Bolsheviks. Politically Czechoslovaks in the Legion were split in their attitude to the Bolsheviks but eventually the anti-Bolshevik stance prevailed and in May 1918 the Czechoslovak Legion in Russia revolted against this decision to surrender to the Bolsheviks and decided to fight their way to Vladivostok. In summer 1918, the Bolsheviks launched terror against the local population which resulted in a series of uprisings against them. Internal tensions within the legion were so grave that in September 1918 the unit refused to follow orders. Josef Svec, one of the founding members of the Czechoslovak Legion in Russia assumed command on October 17, 1918, restored order in the unit, and started preparing for an offensive against the Bolsheviks in the North. The same night, on October 25, 1918, he died allegedly of suicide. Karel Janoušek, one of the anti-Bolshevik hardliners, was appointed interim commander of 7th Company of the II Battalion 1st Regiment the same day by General Milan Rastislav Štefánik and promoted to Captain. Štefánik later died in an air crash on May 4, 1919 when he was trying to land at Bratislava airport in inclement weather. To remind of the general context of this conflict, there was a large German offensive launched in spring 1918 during which as an emergency measure, American forces were placed under General Foch’s command. General Pershing strongly opposed this setup and eventually pushed through formation of the independent American First Army. It has to be stressed that American maneuver war tactics employed by General Pershing was very different from European-style trench warfare which only demanded more manpower provided by the Americans. The autumn of 1918 saw a major shift in the balance of power in Russia due to international balance of forces. As long as the Central Powers dominated the Eastern front, the Allies limited their activities to shipping supplies to the Kolchaks and the Czechs. However, immediately after the Armistice and German withdrawal from Ukraine, the Allies sought to supply anti-Bolshevik volunteer armies through Russian ports in the Black, Caspian, and Baltic Seas, and help them to overthrow the Bolshevik regime. The Allies also provided diplomatic support in order to facilitate legitimacy of the Whites. In late 1918, British MI6 dispatched former naval officer Augustus Agar to Petrograd to recover a British agent on Russian soil Paul Dukes. On June 16-17, 1919, the same team torpedoed and sunk the Russian cruiser Oleg in Kronstadt Harbour. The formation and recognition of the Independent Czechoslovak Army was mainly the work of Tomaš Garrigue Masaryk, Edvard Beneš, and Milan Rastislav Stefanik. From initial number of 2,000 men the size of the contingent grew to 150,000. Achievements of Czechoslovak Legions contributed to the creation of independent Czechoslovakia. In July 1918, Warrant Officer Karel Janoušek participated in clashes between the Czechoslovak Legion which was on the side of the Tsarist Army and the Bolsheviks (Bugulma, Melekess (now Dimitrowgrad), Braudina, Simbirsk (now Ulyanovsk), and Kazan) and on August 7, 1918, he assumed command of the 3rd Company of the 1st Regiment. In September 1918 the Czechoslovaks were forced to leave Kazan and retreat to the left bank of Volga River. On October 28, 1918, Czechoslovakia declared independence from the Austro-Hungarian Empire This was formalised by the Treaty of St. Germain-en-Laye (September 10, 1919). On the way there they defended the trans-Siberian railway against the Bolsheviks and facilitated Allied (British, Japanese, French, and American) interventions against Soviet Russia. On November 5, 1918, a statement of the Allied Governments after the German Government had indicated its willingness to consider signing an Armistice based on President Wilson’s ‘Fourteen Points’, and on November 10, 1918, the Allies announced their demands. But at that time, Czechoslovak Legion was still in Russia, taking part in the Russian Civil War. Janoušek distinguished himself further when his battalion defended the Trans-Siberian railway at Tayshet (May 1919) against the Bolsheviks. In this battle, Janoušek was wounded and stayed in Irkutsk until end of June 1919. On May 25, 1919, Janoušek was awarded the French Croix de Guerre avec palme, and on October 10, 1919, his 7th Company was dispatched for the journey to Vladivostok from where they on December 6, 1919, on board the ‘Yonan Maru’ sailed off to Europe. On February 2, 1920, the transport finally got to Prague. As we learn from the book Master of Spies by František Moravec, who headed the Czechoslovak Intelligence Service for 11 years before and during the war, the period from 1920 to 1930 was the time of building fundamental state structures including defense and intelligence. Even though the political situation was developing fast toward another large scale conflict, the international community was still tired of the Great War and considered the Versailles Treaty and the system of Alliances a sufficient deterrent of another war. 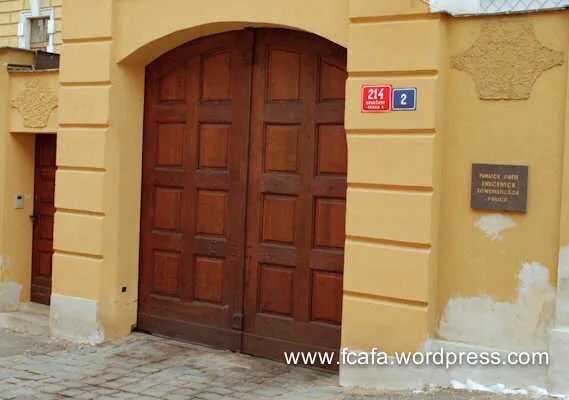 So it happened that yet in 1933-4 the Czechoslovak Intelligence Service focused on private life of former members of the Habsburg aristocracy and completely dismissed the secret building of German armies in violation of the Versailles Peace Treaty. Col. Sergei Ingr complained that the Ministry of National Defense has got no information on location and strength of German divisions even at time of peace; and that is the very basic what an intelligence service should provide. František Moravec also described delicate relationship of Communists, both domestic and Soviet, to Czechoslovak intelligence service between the wars. Janoušek’s experience from the Czechoslovak Legion in Russia launched his career in the Czechoslovak Army and on May 11, 1920, he accepted the offer given by the Ministry of National Defense to veterans from the Czechoslovak Legions to become a career officer in newly formed Czechoslovak Army. In May 1920, he assumed command of the 2nd Infantry Regiment in Dobsina, Slovakia; and then, on July 1, 1920, he was appointed deputy commander of the XXII Brigade in Košice. In 1920, Janoušek commenced studies at newly forming school for General Staff officers. On February 21, 1921, Janoušek was promoted to the rank of Staff Captain, and was assigned to the 12th Artillery Regiment in Uzhgorod. At the time of the mobilisation against Karl I, Habsburg’s attempt to get back in power (October 1921), Janoušek was assigned to a desk job in Košice. In September 1923, Staff Captain Karel Janousek graduated from the War College, shortly before the failed Beer Hall Putsch (November 8-9, 1923) in Munich. He did not stay long at the Provincial HQ in Prague because after a dispute with Lt. Col. Ing Vlastimil Fiala who served at the Air Department and Janoušek accepted his challenge to become an active pilot. In February 1924, Staff Captain Janoušek commenced Military Flying School in Cheb, and on January 1, 1926, he passed as a field pilot – airman, even though not an outstanding one. In reconnaissance, navigation, and meteorology he did much better. On November 19, 1925, Karel Janoušek got married to Anna Steinbachová née Hoffmannová, but the couple remained childless. From January 1925, Staff Captain Janoušek was appointed Commander of the Xth Air Reconnaissance Course and from June 1925 Commander of 2nd School Flying Club. During his assignment at 3rd Flying Regiment of General-Pilot M.R. Štefánik in Slovakia he was on December 2, 1926 promoted to Major of the General Staff. In September 1927, he was sent for a month apprenticeship to the Armee de l’Air in France and on February 28, 1928 was promoted to Lt Colonel, still working as deputy Commander of the Military Flying School. In August 1928, Lt Col Janoušek with Staff Captain František Kleps shined in a military competition of aircrews of countries of the Little Entente and Poland. After this, he was assigned back to the same regiment in Slovakia as deputy Commander, and on December 31, 1930, Commander of the 6th Flying Regiment. In the years 1930-32 he trained officers on the Course for Higher Commanders, together with his other functions. On July 31, 1933, he was promoted to a full Colonel on the day of completion of the Generals’ course. Textbook aviation tactics he co-authored was published in May 1930, and was adopted as an official textbook for the Czechoslovak Air Force. In 1936, 43 years of age, he asked the Ministry of National Defense František Machník for permission to study meteorology and geophysics at the Faculty of Natural Sciences at the Charles University in Prague. As per his words, aviation meteorology was a topic of major interest, as bad weather caused about 50% of all air accidents. At that time, he served as provincial Commander of the Czechoslovak Air Force, and held the rank of Brigadier General. He graduated from the Charles University as a Doctor of Natural Sciences [RNDr] in 1939. The overall situation before Munich crisis deteriorated gradually, but the Pact could hardly be considered a surprise. The British Government stressed that every effort should be made by Dr. Beneš to reach a settlement of the German minority problem in Czechoslovakia in negotiations with representatives of that minority, and that both British and French Governments should use all their influence, preferably jointly, to further such a settlement. European leaders, especially the British, refused to face the Nazi threat. As British General Sir Michael Jackson put it, “Fighting battles is not about territory; it is about people, attitudes, and perceptions. The battleground is there.” In March 1938, the Nazis overrun Austria, which made the already difficult situation of Czechoslovakia even worse. On May 21, 1938, Czechoslovaks activated the so-called border guard, and on September 23 they declared the mobilisation of the Czechoslovak Army. 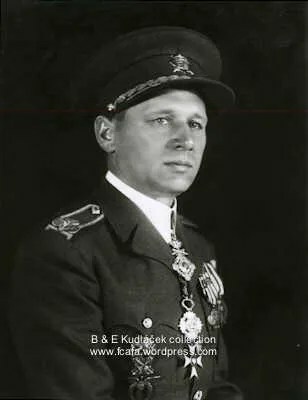 Brigadier General Janoušek was responsible for command of the Air Force of the 1st Army commanded by General Sergei Wojciechowsky, which protected the border from České Budějovic to Kraliky. At that time, General Janoušek had under his command 24 field squadrons (9 fighter, 7 reconnaissance, and 7 intelligence, 3 bomber, and 1 transport squadrons). The Munich Agreement was signed on September 29, 1938, and on October 5, President of Czechoslovakia Dr Edvard Beneš abdicated. To surrender the Sudetenland area meant to give up the country’s natural defenses, namely the fortification system and natural barriers. Military leadership of that time was certainly aware of impact of this decision. Due to agent A-54, the Czechoslovaks received information on German plans in advance, and had information on arms being smuggled into the Sudetenland area from the Reich as well. But Czechoslovak political representation failed to act and apparently lived in complete denial until the very last minute. After the meeting with President Beneš, some Generals considered the creation of a military government but eventually complied. Emil Hácha was elected President on November 30, 1938, 2 months after Edvard Beneš abdicated. The situation which occurred after the infamous President’s Hácha’s signature (creation of German Protectorate, March 14, 1939) was from constitutional point of view pure improvisation. President Hácha ordered the Army to submit to Protectorate rule, whilst trying to correct the damage through domestic resistance later on. Former President Beneš, who first abdicated from his function of President where he was in charge of numerous military assets (October 5, 1938), retired and then reinstated himself in power abroad as a head of anti-Nazi resistance. On the evening before the invasion, on March 14, 1939, intelligence officers called a meeting where they announced that the threat of invasion was imminent and recommended measures which would prevent most important assets fall in German hands. However, no orders were handed down until too late. The Chief of the Czechoslovak Air Force General Fajfr and his deputy General Vicherek ordered that no aircraft were allowed to take-off. III Department of the Ministry of National Defence started organising the transfer of the aircraft to several airfields in Moravia with the intention to get the airfleet to Romania and Yugoslavia. None of these planned intentions came to be instigated. Creation of the Protectorate created a schizophrenic situation in which the existence of the Czechoslovak military and its subordination to a Protectorate government was too much to swallow for many. After surrendering all military assets without a single shot, domestic resistance began to form within the Czechoslovak military – Obrana národa, the Defense of the Nation. Protectorate administration expected the Czechoslovak military to administratively liquidate their own army. Military officers were among the first people who started leaving the country in larger numbers in order to form a Czechoslovak Army abroad and restore the Czechoslovak state. During the first year of the war, 1,270 Czechoslovak airmen had fled the country; that was more than half of the flying personnel. By August 1939, 700 airmen and 3,000 Army personnel got to Poland and from there 500 airmen and about 800 soldiers to France. About 190 airmen stayed in Poland where they, after the fall of Poland, were interned either in Romania or later in the Soviet Union. After the fall of Poland, Czechoslovaks used the southern route via Slovakia, Yugoslavia, Greece, Middle East to France. Brigadier General Karel Janoušek received his Doctorate at the Charles University on June 23, 1939, and used the southern route to flee the country four months after his graduation speech. He was in contact with the resistance group Obrana národa and with the help of their “export section” on November 15, 1939 he crossed the border to Slovakia, and through Hungary, Yugoslavia, Greece, and Beirut he got to France. Karel Janoušek, graduation June 23, 1939 at Charles University, Prague. In Paris, he first reported for duty on December 1, 1939, and was assigned to the Czechoslovak Military Administration (CsVS), where he served as Head of the 3rd (Air) Department of the Czechoslovak Military Administration, what de-facto was a position of a Commander of the Czechoslovak Air Force which was the forming on French territory from the Czechoslovakian airmen who were in France after fleeing their homeland. In his new role, General Janoušek devoted all his strength to formation of the Czechoslovak Air Force units. Even though certain legal agreements had already been in place in the form of contracts, when it came to their practical implementation the situation was far worse. All the urgencies and the pleas were in vain,” recalled Karel Janoušek later. However, administrative delays, inaction of the French Ministry of Aviation, lack of aviation material, as well as fragmentation of the Czechoslovak Air Force at more than twenty locations in France including its Colonies, eventually caused that majority of the agreements remained on paper only. He remained in his function until March 15, 1940, when he was replaced by Brigadier General Ing. Alois Vicherek (who was using cover name Josef Slezak when working for the resistance), who arrived in France some time later and based on seniority he took over this function after him. Karel Janoušek, with other Czechoslovak airmen in l'Armee d'Air, France Spring 1940. Compared to Karel Janoušek, Alois Vicherek was an expert pilot, much more technically oriented. They both served in the Austrian-Hungarian Army, and were both captured by the Russians during the Brussilov’s offensive in July 1916. They were promoted together to the rank of Colonel (July 1933) and the Brigadier General (January 1, 1937), and on May 1, 1940, to Divisional General. The unpopularity of Gen. Vicherek among Czech airmen was caused by his decision to surrender all assets after the creation of the Protectorate and the fact that he showed up among the same people under a different name. There was a major problem which bothered Czechoslovak airmen in France and that was the fact that they had to enlist into the French Foreign Legion for five years without their previous ranks being recognised. This only changed after implementation of the decrees which recognised the Czechoslovak Army in France (January 24, 1940), and decrees which recognised their status including their ranks and financial support (March 2, 1940). Once Janoušek was authorised to organise and manage training of Czechoslovak Airmen, he was expected to take over command of the planned (but never built) Czechoslovak Air Force Training Center, which was to be created in Cognac, a project which due to rapid unraveling of the war never materialised. On May 10, 1940, the Wehrmacht launched its air campaign against the the Low Countries and on June 5, 1940, against France which capitulated on June 22, 1940. In total, 135 Czechoslovak airmen participated in the campaign, dispersed in 26 squadrons, which represented 12% of the French Air Force. Czechoslovak fighter pilots flew about 3,000 operational flights and 3,800 operational hours in the Battle of France. They shot down 78 enemy aircraft with 14 probables, which represents 12% of the total damage inflicted by French Air Force on Germany. Of the 135 airmen participating in the Battle of France, 18 were killed or were listed missing and 30 were wounded. In addition, 26 members of bomber squadrons flew 134 operational flights (390 operational hours). Contributions of Czechoslovak airmen were recognised with the award of numerous Czechoslovak and French awards. On June 18, 1940, a day after the French request for conditions for an armistice, in the ubiquitous chaos of collapsing France, General Janoušek got evacuated to Great Britain. His decision was to let the airmen to evacuate from France individually to England. Together with a large group of Czechoslovak airmen he left French port of Bordeaux on board the ship ‘Karanan’ which on June 21, 1940, brought them to Falmouth in England. In the period from June to August 1940, 932 Czechoslovak airmen managed to evacuate France and get to England. Hugh Trenchard was one the dominant early tactical airpower theorists. Karel Janoušek did study air tactics and even co-authored a book on this topic, which was mainly based on the theories of Guilio Douhet. After WW1, strategic bombing became central to the airpower theory as an alternative to the carnage of static ground warfare. The era of total war was on everyone’s mind as a fact of life which is going to last. The ability to affect industrial capability of the enemy became a realistic possibility. What Trenchard advocated was to destroy enemy industrial targets in order to diminish the enemies will to fight. Unlike Douhet, who considered civilian population a legitimate target in order to destroy morale, Trenchard understood the distinction between killing the enemy civilian population and paralysing their life through destruction of their industrial assets. Crippling supplies and transportation and destruction of key vital assets became critical element for winning the war. The third main air tactics theorist William Mitchell’s most lasting contribution was in the idea of autonomy of the Air Force, offensive nature of airpower, air superiority, strategic bombing, and air support to the Army and Navy. 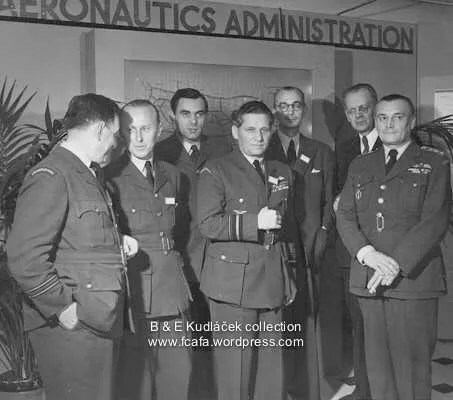 Karel Janoušek with pilots of 312 Sqn. In Britain General Janoušek became the architect and eventually the highest representative of the Czechoslovak Air Force. Because his service senior Brigadier General Ing Alois Vicherek (Josef Slezak) was at that time still in France (he left with the last transport from Sète on June 27, 1940, to Plymouth in England on board the ship ‘Rod Al Farag’ on July 7, 1940); Janoušek was at that time the highest ranking member of the Czechoslovak Air Force on British soil, and as such he assumed command, fast and energetically. Even though he did have the back-up of the still unconstitutional and unrecognised Czechoslovak Government in Exile, the Ministry of Defense, and Command of the Czechoslovak Air Force; still without any military agreement between Czechoslovakia and Great Britain; he was doing all he could to allow the Czechoslovaks to participate in combat operations as soon as possible, preferably within Czechoslovak Air Force units. Together with British appointee G/Cpt Frank Beaumont, who before the war had served as British Air Attaché in Prague, they agreed on the incorporation of Czechoslovakian airmen into the RAF Volunteer Reserve and the formation of Czechoslovak Air Force units, which were operationally subordinate to the corresponding RAF command. Orders for their formation followed in rapid succession. 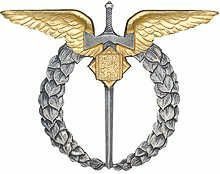 The Inspectorate of Czechoslovak Air Force (Czechoslovak Inspectorate General) had been established as a co-ordinating and liaison body already on July 12, 1940; of which Brigadier General RNDr Karel Janoušek was appointed to head by the British Ministry of Defence, a General who had joined the ranks of the RAF VR and was bestowed the rank of Acting British Air Commodore (British equivalent Czechoslovak rank of Brigadier General). Janoušek’s early appointment in this function was apparently directly related his pragmatic actions and co-operation with the British concept of incorporation of the Czechoslovak Air Force in the RAF. From the Czechoslovak Military administration perspective, Karel Janoušek was officially appointed in his function only on October 15, 1940, by a Presidential Decree from June 18, 1941. Even though the Czechoslovak Inspectorate General was formally subordinate to the Ministry of National Defense, it was the supervisory organ to the Czechoslovak units within the RAF and to all Czechoslovak airmen who were temporarily incorporated in British Royal Air Force Squadrons. It served as a link between the Ministry of National Defense, Czechoslovak Air Force Squadrons, and Royal Air Force and the Directorate for co-operation Allied Force in the Air Ministry (Director of Allied Air Co-operation and Foreign Liaison). The Ministry of National Defense defined competences of the Inspector of Czechoslovak Air Force only with retrospective force, on June 21, 1941, but this did not change the fact that these formally approved competences only confirmed the real status quo. East Wretham, Karel Janoušek with W/Cmdr Josef Ocelka and F/Lt Alois Kirchstein when inspecting 311 Sqn. The agreement was signed on October 25, 1940. 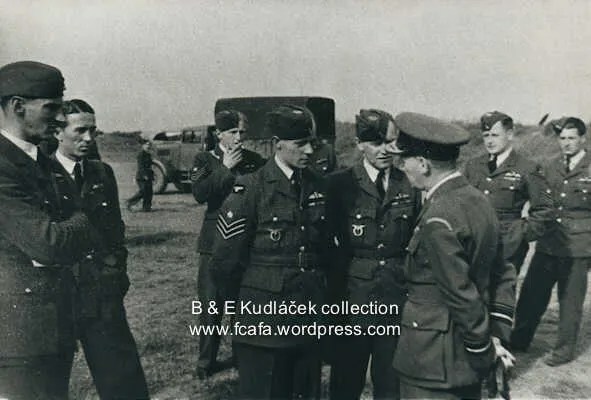 Czechoslovak airmen were organised into Czechoslovak units which were subordinate to the RAF for practical reasons but continued to be Czechoslovak subjects. Selection of personnel was be conducted by British standard for the RAF. Both officers and troops would swear loyalty to the Interim Government of Czechoslovakia and His Majesty the King. Training of those who cannot be assigned to a squadron straight away will be conducted in the existing facilities of RAF. 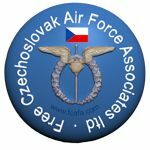 The Inspectorate of the Czechoslovak Air Force would be created in order to monitor the progress of Czechoslovak squadrons and report to the Ministry of National Defense. The Czechoslovak squadrons would be commanded by Czechoslovak officers, although from the beginning the position of Squadron Commander will be assign to a British as well as Czechoslovak Commander, until the Czechoslovak one became able to take over command in full. Responsibility for operational use of the squadrons belonged to the relevant RAF command. The bases where Czechoslovak squadrons were located would be under the command of RAF commanders. Czechoslovak units would get the same treatment as RAF personnel when it comes to material equipment and supplies. 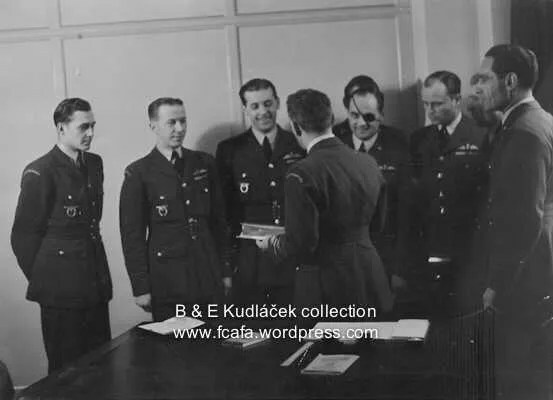 All Czechoslovak officers would be transferred to the RAF as Pilot Officers in cases were they are full trained or Acting Pilot Officers in case were they are not. All promotions would be done as per RAF regulations. Czechoslovak airmen would be paid the same wage as their RAF counterparts, and would wear RAF uniform with ‘Czechoslovakia’ sleeve insignia. Aircraft used by Czechoslovak squadrons would be painted in RAF colours and distinguished by Czechoslovak emblems on the fuselage. Even though Czechoslovak representation strived for revision of this agreement, it remained valid until the end of the war. However, this speed by Janoušek, after the recognition of Czechoslovak Government constitutional approval of the Ministry of National Defens,e met with criticism because of a rushed and too pragmatic resolution of the relationship between the Czechoslovak and British Air Force; Janoušek was accused by both President Dr. Edvard Beneš, Ministry of National Defense Divisional General Sergei Ingr, who effectively lost any direct power over the Czechoslovak Air Force, and understandably also the Air Force Commander Brigadier General Alois Vicherek who in fact became a General without an army. In Janoušek’s defense it has to be stressed that at a time when he was negotiating the integration of the Czechoslovak Air Force into the RAF, the Czechoslovak Government in Exile was not recognised by anyone and there were no constitutional structures or Czechoslovak Governmental bodies, and there was a danger of default as Great Britain found itself in mortal danger and badly needed the help of the trained and experienced Czechoslovak pilots. It therefore remains to Janoušek’s historical merit that Czechoslovak airmen were able, in rather large numbers, to participate in the Battle of Britain in their national squadrons even though under the command of the RAF. 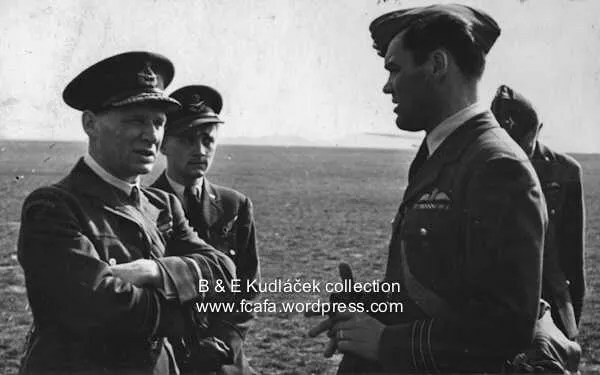 Responsibilities of Inspector of the Czechoslovak Air Force included most importantly the inspection of Czechoslovak squadrons in a way which did not interference the work of their superior RAF commanders. Janoušek’s other duties included organising of the training of the Czechoslovak Air Force, educational and propagation work, and attending meetings with the President. In addition, the Inspector gives proposals for the promotion of Czechoslovak airmen and appointment of Commanders of Czechoslovak squadrons to the President and the Ministry of National Defense. Inspector of the Czechoslovak Air Force also needed to supervise material equipment of the Czechoslovak Air Force as per the financial agreements as defined by the Ministry of National Defense. In the beginning, the Inspectorate consisted of four departments: personal, intelligence, educational, and registry of material. Later, more departments were created: training, medical, transport, general, pastor services, and others. Co-ordination of these services was the responsibility of the Chief of Staff, Lt Col Josef Schejbal, former commander of the 311 Squadron, who was also Janoušek’s deputy. 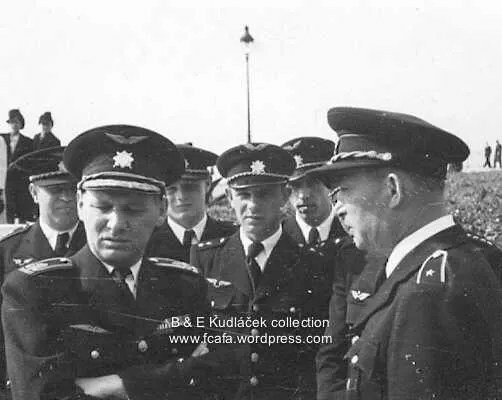 Karel Janoušek with some of the airmen of the Czechoslovak Inspectorate. On December 31, 1940, General Karel Janoušek was awarded the Knight Commander of the Most Honorable Order of the Bath. The order was presented to him on May 20, 1941, at Buckingham Palace directly from the hands of King George VI. Formally, Janoušek’s responsibilities were in direct contradiction with his real influence which he had on President Dr Edvard Beneš and General Sergej Ingr of the Ministry of National Defense. Despite the schizophrenic situation he was in, and multiple serious clashes over fundamental matters, he managed to get on well with both British military and political representation and the Czechoslovak Government in Exile. To commemorate the first anniversary of the formation of Czechoslovak squadrons in the RAF, Janoušek was interviewed by John Snagge for the ‘The World Goes By’ radio program which was transmitted on the BBC Home Service on July 8 1941 and the Forces program on July 10. Snagge:Exactly one year ago this week the first Czechoslovak Fighter Squadron of the Royal Air Force was formed in Britain. Since then, as we all know, Czech airmen have been playing an increasing part in the fight against the common enemy. 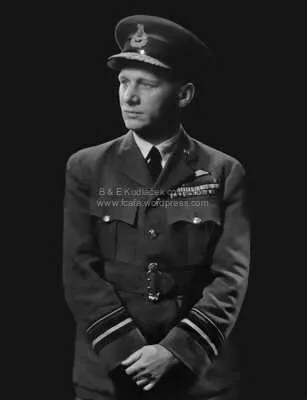 Here is the leader of the Czechoslovak Air Force in this country Air Vice Marshal Karel Janoušek…. Janoušek: This anniversary gives me a welcome opportunity to say thank you to Britain and the British people. In peace time, service in the Air Force appealed to the best of our young people. When it was clear that Hitler meant to destroy Czechoslovakia, our airmen were ready to fight – regardless of the enemy’s overwhelming numbers. They did not get the order to fight. They got an order not to fight. That was blow to them – a worse blow than anything Goering could have given them. They just could not believe the order. Ah! Well there are many things we Czechs could not believe and to which we had had to grow accustomed. Then the Hun invaded our country. Our airmen started to act. Goering knew their value. He even tried to secure their services for himself. He actually asked our Air Attache in Berlin to fly to Prague and offer in Goering’s name, employment in the Luftwaffe to everybody – officers and men of the Czech Air Force. Our airmen knew better. No flattery could deceive them – one by one they left their homes. In their hearts a fierce fire was burning. On they went by night beyond the frontier towards distant countries, where they hoped to find the tools with which to fight the German usurper. They only hoped…As yet remember, there was no war. They had no promises, no guarantees, no certainties. I cannot speak now of their adventures. Very many had experience of prison life. Hunger was their daily companion. They no longer had smart uniforms. Their cheeks became sunken, their eyes more and more sad. Through Poland they went, through the Balkan states, through Asia and Africa – to France. But France fell. Just when they were beginning to regain their self-respect, just when they had shot down over 160 Huns, France fell. Was this an end to all their hopes? Certainly not ! There was still Great Britain. Great Britain perhaps would give them hospitality and let them use her wonderful Hurricanes. So our airmen began to arrive in England at the end of June 1940. Within three weeks the first Czech Fighter Squadron was formed and they had time to get into shape to take part in the Battle of Britain. They shot down 36 Germans in one month, but that was only a start. A bomber squadron followed soon afterwards. Other squadrons were formed later and many pilots are also now fighting in British squadrons. The kindness of your R.A.F. officers and men (and indeed of everybody here) has strengthened our souls to carry on. We have been here one short year. The qualities which make life worth living – liberty, decency, kindness and common sense – they are so evident here and more than ever we realise their value. May I thank you on behalf of our Air Force for the privilege of sharing these things with you. May this next year bring us nearer to victory over the enemy – the enemy not only of (the) British or Czechoslovaks or of any other people, but the enemy of all good. The numbers of Czechoslovak airmen never exceeded 1,600, and the total number of those who are on record in the RAF service is about 2,400. Czechoslovak airmen flew in 38,485 operational flights (54,225 operational hours); Czechoslovak fighter pilots shot down 200 enemy aircraft (confirmed), 61 probables, and another 116 damaged; destroyed 6 unmanned rockets; bomber crews flew 26,719 operational hours during 3,113 operational flights; dropped 1,218 tons of explosives and 92,925 incendiary bombs on targets, and assaulted several tens of ships and submarines; and flew countless hours in reconnaissance, patrol, and observational flights. During their service, 511 airmen perished or were declared dead after being listed as MIAs; many were wounded, and 52 became POWs. Considering that the Czechoslovak Air Force was the only Czechoslovakian combat force, their activities had a large political impact as well. 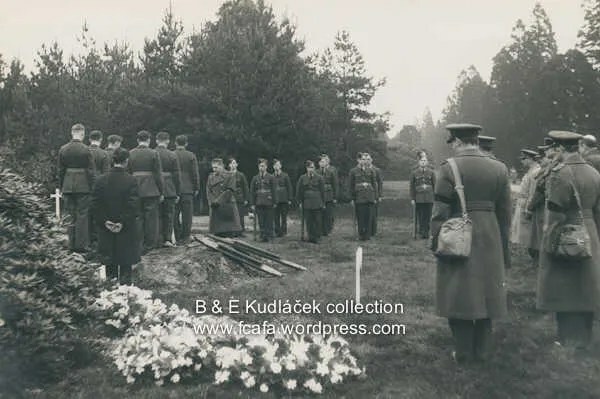 Brookwood, Karel Janoušek at the funeral of one of the 511 Czechoslovak RAF airmen who would not return to their homeland. In November 1943, General Miroslav (Bedřich Neumann) asked the RAF A/C/M Sir Charles Portal to free Czechoslovak Air Force for operations in Czechoslovakia under Czechoslovak command once the situation at homes develops into a national uprising. The response arrived on January 17, 1944, and only stated that when a situation like that occurs, it will be dealt with in context by the British command. In December 1943, the Czechoslovak Government in Exile signed the Czechoslovak – Soviet Treaty of mutual cooperation in Moscow, an agreement which in the eyes of the post-war U.S. Ambassador to Czechoslovakia Lawrence Steinhardt was the root cause of Communist coup in Czechoslovakia. Of all the nations of occupied Europe, only the much more numerous Poles were the only ones who accomplished the same thing. Dysfunctional division of responsibility over Czechoslovak Air Force between Brigadier General Ing Alois Vicherek (Josef Slezak) who was subordinate to Czechoslovak organs, and Inspector Air Vice Marshall RNDr Karel Janoušek who wore British uniform, lasted only until August 3, 1941. Because Czechoslovak Airmen had became part of the RAF Volunteer Reserve for the duration of the war, Vicherek’s function became redundant and to the abovementioned date was cancelled. General Vicherek was transferred to the Alternative body of the Ministry of National Defense and President Beneš found for him a vacancy in the Section for special tasks with focus on industrial matters. In this function he was supposed to work as a representative of Czech interests with regards to the arms trade. In 1943, Vicherek got seriously ill with thrombosis. Upon recovery in December 1943, he returned to service, and was appointed by Gen Ingr Head of the Czechoslovak Red Cross Abroad. In the end of the war, General Vicherek left for the Soviet Union where he was supposed to take over command of the Czechoslovak Air Force in the USSR. This was too late because on May 1, 1945 when he got there the war was almost over, but due to his trip he got in close contact with the delegates who drafted the Košice Government Program and the new army leadership. Orientation to the Soviet Union did not bother him. On May 29, 1945, General Vicherek was appointed the Commander of the Czechoslovak Air Force. Divisional General RNDr Karel Janoušek served in function of Inspector General of the Czechoslovak Air Force in Great Britain, a job requiring high level organisational and diplomatic skills, for a full five years, until October 19, 1945, whilst on May 17, 1945; he was promoted to the rank of Air Marshall. So he became the only Czechoslovak citizen ever who was ever promoted to the rank of an Air Marshall. 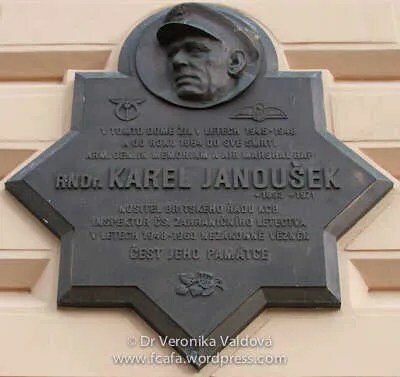 Apart from his service duties, which took him everywhere where Czechoslovak pilots served, that meant to the USA, Canada, and the Bahamas, Karel Janoušek also closely followed dynamically developing aviation technology. In his function of the Head of the Association of Czechoslovak Engineers and Technicians (effective since June 14, 1942), he fought for the best possible conditions for Czechoslovak technicians in order to absorb the immense war development, mainly in the field of aviation. Acting on his initiative, the Czechoslovak Government established a consultation committee for the formation of civilian aviation. In December 1944 he was sent, as a delegate, to an international conference on civilian aviation which took place in Chicago, USA. In a conference attended by more than 1,000 delegates from 52 countries, he participated in the drafting of the International Civil Aviation Convention, [ICAO], International Air Services Transit Agreement, IASTA, and International Air Transport Agreement, [IATA], and the establishment of the Provisional International Civil Aviation Organization, [PICAO]. At the same time, he put through a request for a Czechoslovak delegate on the PICAO Council. Canadian Montreal was selected to host headquarters of both institutions, PICAO and IATA, which ensured the mutual commercial and technical contact of airline corporations. 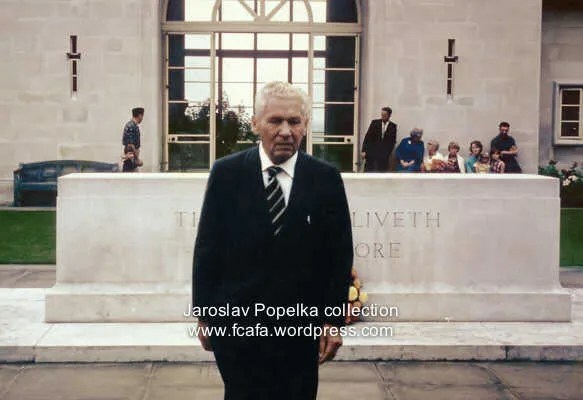 Karel Janoušek at USA conference. Now that the time has come for us to leave this charming and hospitable land, where we have shared with you the joys and sorrows during the past five years of our common struggle; I would like to express to the British people on behalf of myself and of all Czechoslovak Air Force Officers and men, our deepest gratitude for all the kindness they have at all times so readily shown us and for making us feel so much at home. However, our most profound gratitude and our greatest admiration go to our gallant brothers-in-arms of the Royal Air Force, with whom we were fortunate enough to engage and help in defeating the enemy in the glorious Battle of Britain, which saved not only this island, but the whole world from enslavement and destruction. Now we are on the eve’ of our departure and approaching our journey’s end, this is truly an occasion for rejoicing and yet we are departing with mixed feelings, for there are very few of us in the Czechoslovak Air Force whose families escaped persecution and often death at the hand so f the Germans, a price our dear ones had to pay because their sons had taken up arms against the enemies of human freedom. For many it will be a sad home-coming, full of anxiety and sorrow. In fact there will be many of us who will have no home to go to and no parents or relatives left alive. And yet, we are all looking forward to our return in order to help in the re-building of that which has been destroyed and to assist in the important task, which is today confronting all the Allied nations namely the laying of solid foundations for an enduring peace and for a better world. Although we are leaving you we all hope most sincerely that the bonds of friendship forged between our two nations as a result of our happen association with the Royal Air Force, which will always be one of our most treasured memories, will not only remain a solid link unifying our two peoples but will strengthen even further in the days of peace. Once again allow me to thank you for your friendship and your hospitality. Divisional General RNDr Karel Janoušek finally returned to liberated Czechoslovakia, after several delays, three months after the end of the VE Day, on August 13, 1945. Upon return he learnt that the Nazis had imprisoned nearly all his family members and relatives. His wife and one of the sisters died in Auschwitz, one of his brothers in Buchenwald, and two brothers-in-law in Litoměřice and Pankrác prison, respectively. This tragedy was closely related to his activities during the war, and Janoušek was greatly troubled with the consequences of his work in the Czechoslovakian Armed Forces in Exile to his own family. It has to be stressed that the Habsburg monarchy never turned to repression against family members of dissidents and resistance, and this level of repression employed by the Nazis was relatively new, and therefore totally unexpected. This is a conclusion which historian Jiří Rajlich drew from diaries of airmen who fled abroad in 1939. The Czechoslovak Government in Exile remained in power until October 27, 1945 as “Interim state regime” (July 21, 1940 to October 27, 1945). Dr Edvard Beneš who remained the President, and the State Council which consisted of members appointed by him during the war, had both legislative and executive power. The Constitution of 1920 remained formally valid until May 1948 when it was replaced by Gottwald’s one. During his time in power, Beneš’s Government in Exile issued 15 constitutional decrees which retrospectively became constitutional acts through the Act 57/1946. The early post-war decrees of Edvard Beneš then implemented objectives as defined in the Czech-Russian Agreement (December 12, 1943) and the Košice Government Program (April 5, 1945). This included orientation of foreign policy towards Slavic nations led by the USSR, exclusion of “fascist elements” from society to protect “the people”; draconian measures against “traitors”; introduction of Peoples’ Tribunals, National Committees, and Agrarian Commissions; creation of the National Land Fund for the redistribution of confiscated land; and imposition of the national management over the property of collaborators and traitors and expelled Germans and Hungarians. In September 1946, the Nuremberg War Crimes Tribunal declared the Munich Agreement invalid; and in the case of Czechoslovakia formally confirmed the status quo regarding its territorial integrity, and invalidated Nazi territorial gains. The “project Czechoslovakia” was an attempt to build a new regime after implementation of profound changes in political, military, and social economic spheres. 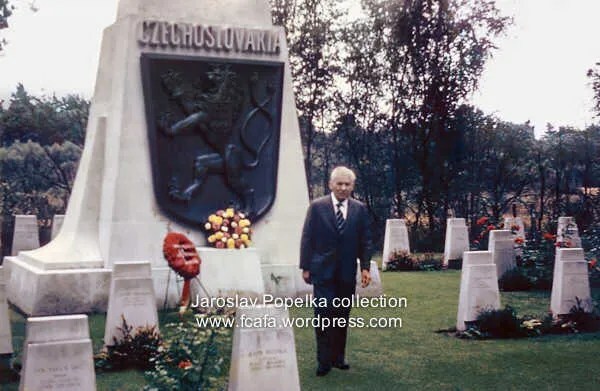 General Karel Janoušek’s function of Inspector of the Czechoslovak Air Force ceased to exist on October 19, 1945. Without doubt, he logically aspired at least for a function of the Commander of the Czechoslovak Air Force, or possibly even the Ministry of Defence. His achievements and political outreach of the activities of the Czechoslovak Air Force in Great Britain supported these aspirations. But the new Ministry of National Defense General Svoboda and Chief of Staff General Bohumil Bocek already on May 29, 1945, appointed in this function his former rival and opponent, Divisional General Ing Alois Vicherek, who returned to his homeland through the Soviet Union and was therefore for the coming orientation of the Czechoslovak Army more palatable. However, Janoušek’s undeniable war achievements could not be completely ignored at that time just yet, and that’s how he on October 20, 1945, accepted the offered function of Deputy Chief of the General Headquarters for Special Tasks. This closely resembled the fate of Alois Vicherek at the time of formation of thr Czechoslovak Air Force in France, and his removal from high level posts in the Czechoslovak Air Force. In 1945, Janoušek received an offer to go to Canada which he refused, and decided to remain politically active in Czechoslovakia and joined the Czechoslovak Social Democracy. At this time, Janoušek accepted the mainstream opinion that the principle of apolitical armed forces should be dropped. In January 1946, he was appraised by General Bohumil Boček as “lazy, insincere, and disgruntled”. This clash was rooted in fact that Janoušek had no respect for General Boček and could not be bothered to hide his feelings. In spring 1946, Janoušek travelled to Great Britain where he negotiated contracts for the purchase of British and American aviation material for Czechoslovak Air Force. On June 8, 1946, he took part in the Victory Parade in London, and on June 11 he was invited to a Royal Garden Party hosted by King George VI. 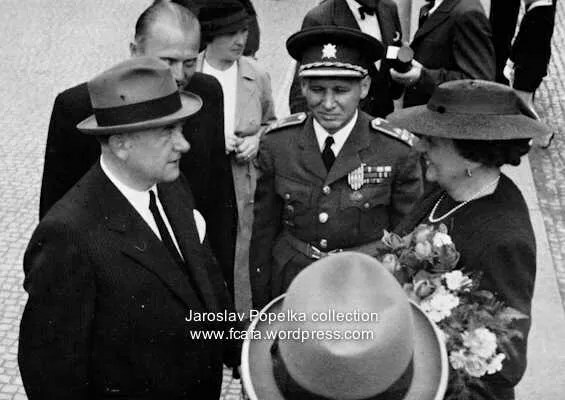 On September 15, 1947, two months after Czechoslovakia had refused the Marshall Plan, Janoušek was part of Czechoslovak delegation which participated in the 7th anniversary of the Battle of Britain. His social life and frequent visits of Foreign Embassies were at that time already closely monitored by the Obranné zpravodajství [OBZ], Defense Military Intelligence. In October 15, 1947, General Boček in his appraisal stated that “Janoušek is not suitable for a position in Command because of his attitude and therefore should only be employed in administration”. On February 15, 1947, he was appointed in the newly established function of interim inspector of Air Defense by the General Staff, where at least in theory he was able to use his experience from the war, especially from Great Britain, which had at its disposal an efficient early warning system and all defense measure against air attacks. But in his function he only had minimum power because anti-aircraft artillery was moved to the Army and fighters did not fall under his command either. In Czechoslovakia, similar system was still in an embryonic stage and was only satisfactorily resolved only in the 1950’s when the geopolitical situation was entirely different. Karel Janoušek, before the Communist coup, February 1948. In February 1948, Janoušek participated in a course for senior officers where he was supposed to familiarise himself with the Soviet Doctrine. According to Janoušek’s opinion, politically unreliable officers were in this way isolated from their units and excluded from the decision-making loop during the critical period of the Communist coup. The vast majority of officers who attended the concerned course was dismissed from the Army immediately after establishment of the government of the National Front; and the remaining ones, who cooperated with the regime initially, were removed within another two years. On February 28, 1948, General Bohumil Boček ordered General Karel Janoušek, General Alois Liška, and General František Moravec to take leave “for health reasons” until a final decision could be made. Janoušek spent his time in Karlovy Vary. Formally he was retired on June 1, 1948, but at that time he was already under arrest. In March 1948, after several unsuccessful attempts to get a position in civil aviation, and a personal interview with General Šimon Drgáč, who confirmed there is no space for people of his qualities in the new regime, Janoušek wrote to JUDr Josef Dubský at the ICAO in Montreal which he had personally helped to establish. A positive response came back immediately and Janoušek asked General Boček for permission to legally leave the country. General Boček referred him to the Chief of 5th Department (OBZ – Defense Military Intelligence) Bedřich Reicin who was one the most important and most ruthless NKVD agents in the Czechoslovak armed forces and Janoušek’s request was categorically rejected. Janoušek was on April 30, 1948, arrested during an attempt to escape, which was provoked by an undercover Communist informer Ing Jaroslav Doubravský (also had cover names of Jan Hrubý, Igor Dischinger, Antonín Navrátil or agent A-5), who worked for the OBZ (Defense Military Intelligence). Thus he became one of the first victims of the Communist regime, among 27 generals and 813 other top ranking officers in 1948, and 6,500 in total during the period from 1948 to 1950. On May 2, 1948, Janoušek was brought for interrogation to the prison in Kapucínská ulice 2/214, Hradčany, which belonged to the 5th Department – the feared OBZ. On May 6, 1948, he was together with other RAF airmen Vlastimil Chrást, Jan Stepan, Josef Hanuš, Josef Bryks, Josef Čapka, Otakar Černý, Ondřej Špaček, Jan Plášil, and Václav Bozděch, and another 14 civilians. In the trial which followed he was on June 17, 1948, sentenced by the High Military Tribunal in Prague to 18 years of hard prison. On the accusation, which was elaborated by Military Attorney JUDr Jan Vanek, charges of desertion and treason were included; and the punishment demanded by prosecution was death by hanging. Defense Attorney General Justice JUDr Josef Adam and invited expert Lt Col Karel Zadina tore the accusation apart so badly that Vanek had to invite Col. Bedřich Reicin for help. Reicin’s “witness statement” influenced the final verdict by Judge Lt Col Justice JUDr Karel Hermann-Otavský. In addition to 18 years of hard prison, Janoušek was stripped of his rank, his awards, and his Doctorate. On December 30, 1948, the Highest Military Tribunal rejected Janoušek’s complaint of a mis-trial as unjustified, and approved similar complaint submitted by Vanek. The re-trial took place on February 9, 1949, under completely different circumstances. On January 20, 1949, the same tribunal had sentenced General Heliodor Píka to death. Following his appeal which was heard on February 9, 1949 at the State Court in Prague, Col Justice JUDr Jan Metlička increased his sentence to 19 years. Col Chrást was sentenced to 15 years in prison; Major Bryks, Staff Captain Čapka, and Captain Špaček got 10 years; and Staff Captain Černý was sentenced to 3 years hard labour. All of them appealed against the decision but the verdicts were confirmed by the appeal court and came in force on May 26, 1949. The first prison Janoušek experienced was the so-called Kremlin at Plzeň – Bory. Here, a young prison guard Jaroslav Flemr approached Janoušek with an escape plan. Janoušek did not react to the offer because he considered it yet another trap. Flemr was arrested on November 29, 1949, and sentenced for life. Army Veteran from Dunkerque Major René Černý and General Karel Janoušek were tried in March 1950, because they knew about Flemr’s initiative and did not report it. They were both sentenced for life, appealed against the decision, but on September 8, 1950, the Highest Court confirmed the decision. By the end of 1949, 24 prisoners sentenced by military tribunals had escaped from Bory, and only 4 of them were recaptured. On April 18, 1950, the head of Bory prison Staff Captain František Šafarčík announced that the prison authorities discovered an uprising and planned attempt for mass escape. A wave of terror was launched; and in a trial which took place on May 11-12, 1950, Čeněk Petelik (prison guard), Major René Černý, and Stanislav Broj (Member of Parliament) were sentenced to death and executed. Among those who received long prison sentences were General Antonín Pelich, Staff Captain Jan Prokop (RAF), and Major Josef Bryks (RAF). Janoušek was then moved to Opava prison, in June 1952 to Leopoldov, and in November 1956 to Ruzyně where he was placed as a stool-pigeon in the same cell with former commander of the Engineer Corps School of the Waffen SS in Hradištko, SS-Oberfuhrer Emil Klein, who was trying to use his alleged knowledge of the Third Reich secrets to ensure better conditions for himself for his future. In 1955, as a result of the Presidential Amnesty of Antonín Zápotocký, Janoušek’s sentence was shortened from life to 25 years. As a 60-years-old man, he still had 25 plus 19 years in prison ahead of him. Later in 1956, the original life sentence, now shortened to 25 years, was re-qualified as mere failure to report a crime, and his sentence was shortened to 4 years, and the 19-year sentence was reduced by 3 years. Even after these reductions, he still had 20 years to go. This was highly likely related to the Khrushchev Secret Speech at the 20th Communist Party Congress (February 25, 1956) and the process of de-Stalinisation which followed rather than anything Janoušek did personally. Most political prisoners and especially those with military experience hoped for a major conflict between the USSR and the USA which would in their eyes lead to their release. The outcome of the Hungarian Uprising in 1956 and the Suez Crisis thwarted these hopes. Janoušek was eventually released under a Presidential amnesty on May 9, 1960, during which many political prisoners were set free at the commemoration of 15th anniversary of the liberation of Czechoslovakia by the Soviet Union. In May 1960, a US U2 spy plane was shot down over the Soviet Union, and the incident was presented by Khrushchev at the Conference in Paris. President Eisenhower refused to apologise. In total, Karel Janoušek spent a full 12 years and 10 days behind bars. Karel Janoušek was released from prison when he was 66 years old. The top brass of the Czechoslovak Army was either dead, rotting in prison, or barely surviving in outright poverty. Some managed to flee abroad. Because all Janoušek’s property was confiscated; and he got only a minimal pension (200 CZK a month), he had to work as clerk at Textil, a national enterprise in Prague, from where he retired in 1967 when he was 74 years old and his pension was increased to 600 CZK. On July 5, 1968, the Higher Military Tribunal in Příbram cancelled his twenty years old charges; although for theses rehabilitations it is characteristic that his rank of General and his Doctorate were not returned to him. This only happened on August 23, 1990, via an order of the President of the Czechoslovak Federal Republic; and on December 2, 1991 he was promoted to the General of the Army (equivalent of a four star). Karel Janoušek died on October 27, 1971 in Prague. Family and friends, despite the objections of the authorities, played a state anthem on his funeral. Karel Janoušek, September 1965, Brookwood. Karel Janoušek, September 1965, Runnymede. Karel Janoušek was awarded a total of forty Czechoslovak, Russian, Yugoslav, Romanian, Polish, French, British, American, awards and Norwegian orders. Amongst these awards are the Commandeur de la Légion d’honneur (1945), Knight Commander of the Order of the Bath (1941) and American Commander of the Order of Merit (1945). A Memorial plaque to commemorate him is located at U Železné lávky 127/4, Prague 1. © Dr Veronika Valdová 2012. This is a most incredible article and explains so much to me about what generally happened during and after the War. My Father was in the RAFVR , Czech Squadrons, but spoke very little about what happened during and after the War. He returned to Czechoslovakia with my Mother and me ( a 3 month old baby ) but VERY fortunately he chose to “leave” again and I was brought up in England. My relations in Czechoslovakia didn’t have it so easy…. Dad never spoke much about what had gone on altho’ his basic story was of escaping through what is described here as the “Southern Route” up into France and eventually to England. Reading the story above of General Janousek makes for chilling reading of life after 1945 and the terrible injustices done to so many of the men who were the real heros of the last war. Their terrible mis-treatment at the hands of the new regime doesn’t bear thinking about , but we must and never forget. The film ” Dark Blue World” made in 1997 is well worth watching if you’ve not seen it already, as it shows how life was for those hapless returning Airforce pilots. Thanks for a very detailed biography, but there is something wrong with pictures. Sabaton, best history teacher I ever had. Great song about Karel Janoušek. Thank you for keeping the story of this noble hero alive.